We recognize that access control, also known as entry management, is extremely important when protecting people and property. 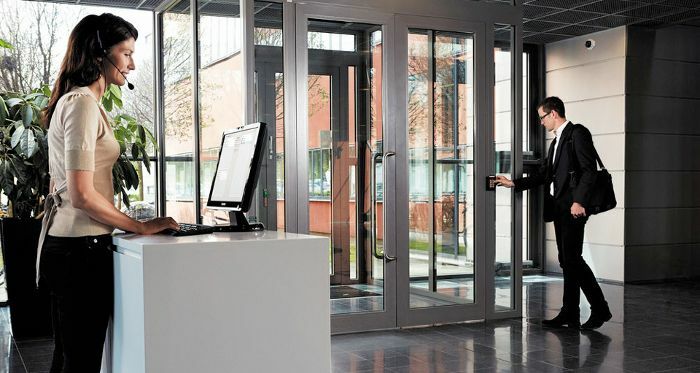 Access Control Systems promote a sense of safety among residents and employees in your community and/or workplace. Know who went where, and when. Restrict access to certain areas and to certain employees within various timeframes. Reduce costs, lessen your workload and ensure that data is safe. Save time and money by avoiding expensive rekeys and lock changes. Using either a software or web-based system allows administrators to make changes and supervise your system from anywhere. This ensures that immediate changes can be made such as the de-activation of a security access credential at any time. Intercom systems complete with video ensure that only people who are properly screened gain access to your building. View your subjects at the same time you are speaking with them. Biometrics offer the ultimate in individual identity assurance. It can be used in combination with traditional access control, for higher-security areas, etc. This measure compensates for the possibility that an access card could be found and used for entry by the wrong person. We offer scalable solutions to accommodate for single to multi-door projects, as well as multi-site installs and service. To provide synergy and cost savings, we offer expert integration of access control with video, alarm and other security systems. Lessen your IT workload and cost. We reduce dependence on a devoted IT employee and/or free up the time of your current IT personnel. This is because we handle the hosting and back up, and the service and maintenance that accompany them. Reduce worries of data loss. With off-site data storage offered by K&J, you will never lose valuable information or undergo a security interruption.